This scene was kind of inspired by a couple of my Small World friends, Tallooley and Brenda. Tallooley made the beautiful geraniums for me a while back to go on this patio. Later she sent the even more fabulous geranium & ivy combo that's now on the wall, and the first geraniums were moved to a pot on the ground. 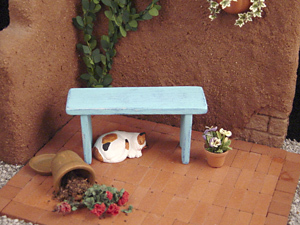 As I was pondering what sort of scene this patio seemed suited for (I hadn't really thought any further ahead than the geraniums at that point), my eyes happened to land on the little cat Brenda made. 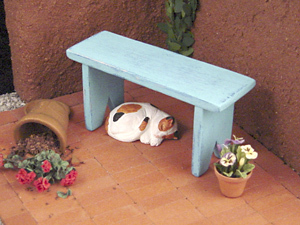 Now, I'm not saying that when I think "Brenda" I automatically think "mischief," but the next thing I knew the pot was tipped over, dirt and flowers and pot shards were everywhere, and that darn cat was sleeping under the bench like nothing had ever happened. I just hope Tallooley doesn't mind that her geraniums suffered such a fate! The scene still needs some finishing details like red trumpet flowers on the vines, and the lizard and some cacti and other bits & pieces, but you get the idea. I've posted it in the Gallery on my website, and I'll add new photos when it's finished. I love it Grace, it tells a story..
Are you sure it was the cat? Absolutely incredible as always grace, looks like it could have been in one of our back yards, those damn cats. Thanks for your comments, Debbie, Rosanna, and Gaye! I couldn't resist showing it off, even though it's not quite done. Rosanna, your books are on the way, I hope you enjoy them. Grazie! 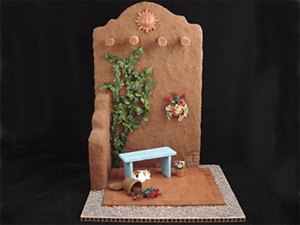 I love this scene Grace - it reminds me of one I did in quarter scale in my Town Square gardening shop, where a kitty is chasing something into a pot, pot upended, more shards are on the floor, etc. I love a 'story' and I especially love cats getting into mischief!